Flexo (flexographic) printing utilizes flexible plastic plates mounted on cylinders to apply ink to the label substrate one color at a time. It can print on almost any substrate including plastic, metallic films, cellophane, paper, foil, acetate film, brown paper, and other materials used in packaging. Flexo has an advantage over lithography in that it can use a wider variety of inks — such as water based and UV inks rather than oil based inks. This capability is optimum for the medium- and long-run label needs of our customers. Where digital quality is not required, flexo offers our customers an affordable answer to medium- and long-run label requirements. Digital printing with our HP Indigo WS6800 Digital Press provides our customers with unlimited options. The HP Indigo electronic printing process combines high-performance digital imaging technology with the liquid ink offset printing process. The merging of electronic imaging with liquid ink offset printing combines the flexibility of on-demand electronic printing with the quality of offset printing. Digital offset color is the HP Indigo electronic printing process that combines high-performance digital imaging technology with the liquid ink offset printing process. The merging of electronic imaging with the properties of liquid ink offset printing combines the flexibility of on-demand electronic printing with the quality of offset printing. As in offset printing, digital offset color printing transfers the inked image from the image carrier to a blanket, and from the blanket to a substrate. However, unlike offset printing, digital offset color printing creates a different image with each revolution—all without the use of film separations or printing plates. Wide variety of materials: Labels can be printed on a multitude of substrates, one of which will meet the exact requirements of your application. We stock the most common materials: semi-gloss paper, PCW recycled paper, clear and white films. Precise registration: One-shot color technology allows simultaneous printing of all separations eliminating registration issues and enabling the use of a variety of substrates. Any color matching: the HP IndiChrome Plus (CMYK + orange, violet, green) expanded color gamut achieves a closer match to PMS (Pantone Matching System) colors and a broader applications range. Spot color jobs: On-press Fast Ink Replacement (OFIR) allows on-the-fly replacement of special/spot colors and eliminates time needed for swapping colors. 1. Offset quality: Up to seven colors, including spot colors, white, and eye-popping fluorescent colors. The Indigo allows us to print up to 97% of the Pantone color range without compromising production speed. The HP IndiChrome on-press simulates Pantone solid colors with CMYKOV values. With industry-leading print quality, our customers’ products will stand out in the marketplace. 2. On demand (aka Just in time) printing: Fast turnaround and just-in-time service helps our customers get their products to market quickly. The Indigo press allows us to change spot colors on the fly while printing—and without losing production time. The pre-press process is simplified: eliminating the need for film, color separation, and plates. What does this mean for our customers? In a word: flexibility. Order only what you need, reduce your label inventory, reduce overhead, and reduce spoilage. And most importantly, get your labels when you need them. 3. Cost: Print jobs with runs as few as one label—and up to hundreds of thousands of labels—cost effectively! The digital process simplifies the pre-press workflow eliminating films, plates, chemistry and waste, and dramatically reduces set-up time. The simplification of the production process allows us to provide customers with cost effective short and medium run jobs. 4. Variable data: Variable data printing enables our customers to personalize their products and protect their assets. Variable data is not limited to serial numbers and barcodes—on any label job each and every label can have unique text and/or graphics. 5. Green printing: Digital printing is more efficient and reduces waste. 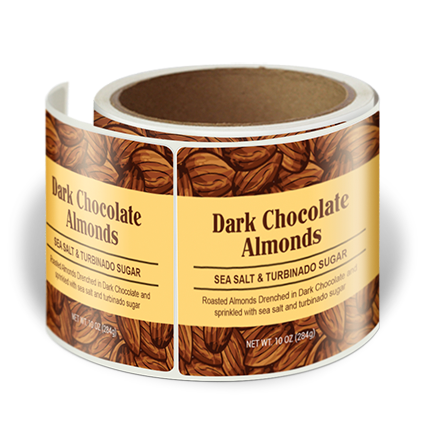 The process used to create these labels significantly reduces set-up and raw material waste to landfills versus traditional printing methods. One-shot color technology allows simultaneous printing of all separations eliminating registration issues and reducing wasted ink and wasted material over traditional methods.